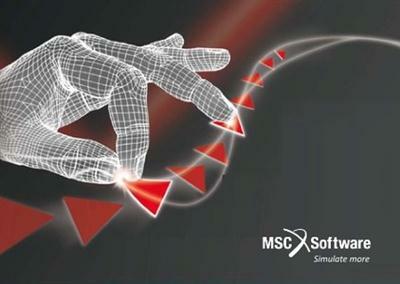 MSC Software Corp. has announced the 2014 release of Marc, its general-purpose, nonlinear finite element analysis (FEA) solution for simulating part and product behavior under static, dynamic and multiphysics loading conditions. Marc 2014, according to the company, introduces a new 3D crack propagation capability to more accurately predict failure in products. The release also delivers enhanced nonlinear contact features, improved modeling for electromagnetics as well as easier CAD defeaturing and mesh generation capabilities. For better accuracy of crack propagation studies critical in safety-related industries, Marc 2014 offers a new capability for high-cycle fatigue that, says the company, will help engineers determine whether cracks will propagate and reach a critical length after so many cycles. How it operates is that a small number of representative cycles are modeled in Marc, after which Paris??? law is used to calculate the number of cycles before damage. Marc 2014 also has been enhanced with an improved method for scaling crack growth along a crack front and between separate cracks, which helps improve the accuracy of the solution, according to the company. MSC says that enhanced nonlinear contact capabilities in Marc 2014 improve convergence. This improvement, explains the company, is achieved through upgraded defaults designed to realize convergence in fewer iterations with less user intervention when using segment-to-segment contact. Implementing a friction model has also been updated to improve convergence and the accuracy of contact solutions. The Marc pressure cavity capability, which is available for planar, axisymmetric and 3D analyses, has been expanded so that it now supports a nearly incompressible fluid as well as a perfect gas law. MSC says that this enhancement will help solve a new class of problems such as water-filled bottles, hydromounts, seals and other containers. Engineers can now analyze the performance of the fluid-filled containers without explicitly modeling the fluid. The electromagnetic capabilities in Marc see the introduction of a circuit approach that lets engineers apply either current or voltages to a system. When combined with Marc?? ?s thermal and structural capabilities, this facilitates solving problems ranging from solenoids to induction heating of rolling processes, says MSC. The electromagnetic capabilities may also be used for other low-frequency applications, notes the company. The company says that Mentat, the integrated Marc user interface for nonlinear analysis and pre- and post-processing, has been enhanced to improve productivity with the introduction of a new method to allow import of geometry from most CAD packages. Geometric operations may be performed on native Parasolid geometry, and removal of small features like holes, fillets, chamfers, small surfaces and small bodies can be achieved with defeaturing. Features can also be offset or moved after the CAD model has been imported into Mentat. Marc 2014 also introduces a new automatic meshing capability that supports three types of Parasolid bodies - wires, sheets and volumes. Either a fully automatic approach or a flexible, user-controlled meshing approach is available to mesh solids with lower- or higher-order shell or tetrahedral elements. Incorporating dimensional and curvature information can perform meshing of complex assemblies. The model can be directly used for a contact simulation. Marc is customizable with user subroutines. More than 175 user subroutines are available to incorporate advanced material models, load and boundary conditions or element technology. Additionally, the Mentat interface can be customized using Python. Marc supports multicore desktop workstations as well as parallel systems and takes advantage of available GPUs (graphical processing units) to achieve higher performance.